The interminable delays to get the utilities disconnected before demolition were enough to send anyone barking mad. Why does it seem the left hand never communicates with the right at the big utility companies? We spent hours and hours on the telephone trying to explain our requirements for temporary builders supply of electricity and disconnection of the gas. One of the challenges was to fully understand if we needed a single phase or three phase connection for an air source heat pump…we received many contradictory opinions but finally settled for three single phases. This was further complicated by the need to preserve the two existing MPAN numbers in order to maintain our government feed-in tariff for the solar panels. Losing the associated MPANs would have jeopardized half the feed-in-tariff and this would have been a significant financial loss over the lifespan of the panels. We encountered a universal gap in knowledge about this. It took us over three months to figure this out and get a satisfactory solution. If you’re considering your own build project, make sure your own timescale allows sufficiently for utility companies to understand and process your orders…factor in unforeseen delays! 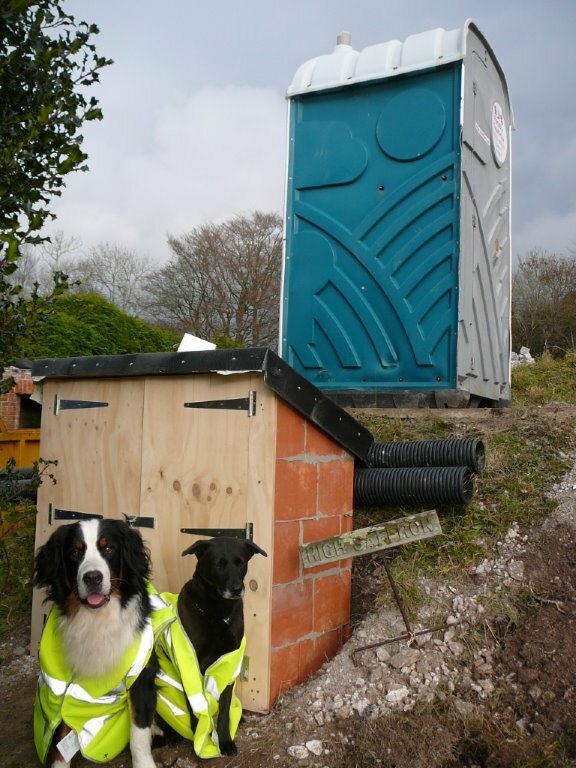 Pictured are our canine groundworkers, Hudson and Sweetie, next to the kiosk for electricity. Sky House Sussex will be a dog-friendly guest house, with full dog-washing facilities for guests who’ve been tramping through the beautiful Sussex countryside which adjoins the property.